Your IP (Internet Protocol) address is your unique ID on the internet. It's synonymous with your home address. Anyone in the world can contact your computer through its IP address, and send a retrieve information with it. I'm sure at one time or another you've heard that hackers can hack your computer via your IP address. This is one of the reasons proxies and anonymity services exist, to protect people from learning your IP address. So how are hackers using just an address to get into your computer and make your life hell? Open ports. Your computer runs services like media sharing on what are called ports. A port is just an opening that a service uses as a communications endpoint. There are 65,535 total allocated ports in TCP/UDP. To exploit a service on a port, a hacker would banner grab for the software and version. After they learn that information, they would search sites like Packet Storm for known exploits to run against the service. 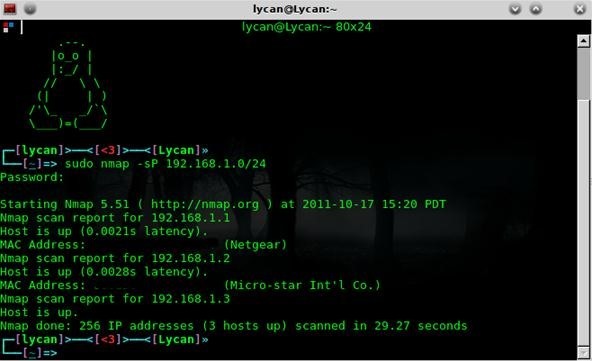 Today's Null Byte is going to demonstrate a simple "port scan" on local computer using Nmap, and teach how a hacker would exploit these services, as well as how to guard ourselves against it. 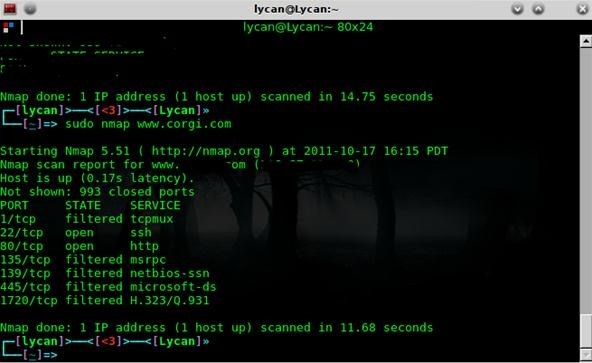 This will be done under Linux, but Nmap is available for all platforms. If you can't figure out how to install it in Windows with the GUI installer (yeah, right), follow along using Cygwin. Bold words are commands that must be entered in a terminal emulator. Nmap should now be installed! Let's scan a local computer. I'm going to use a website as an example, rather than a local computer. This is because my firewall is absolutely crazy, and filters out scans. Don't scan a remote computer with the intentions of doing bad deeds. This is for educational purposes only. That should return a list of hosts that are up for a port scan! As you can see, this target has MANY open ports. SSH piques my interest, so let's move on to banner grabbing to learn the software version or our choice of service. From this, I would learn which software version the service is running, then see if I can find a way to exploit it. Luck for all of you lovely people, I recently made a tutorial on iptables, which will filter out unwanted connections. Also, disable any unnecessary programs that connect to the internet (remote administration, media sharing, etc). Windows users, install Comodo firewall, it's incredible and uses a simple point and click installation, and will filter ports for you. It has great default settings and it is free. do you have free hacker program ? i want to hack my frnd computer. he has given me a permission to hack his computer. hey did you get the answer for your question? if yes please tell me why this keeps happening. The banner will only appear if there is a web server running like IIS or Apache. how to hack ip address ? Welcome to our community of hackers here at Null Byte! Do you have BackTrack installed? If so, Metasploit is included and you can use it to hack. hi, i dont if there's any related post about what i'm looking for but what if i want to access my home computer by another computer in another network. If you enable RDP on your home computer you can access it remotely. can someone help me please. somebody is hacking into our school network and shutting down our computers. we work on computers almost all the time and it is annoying us. a have basic knowledge on linux and i know java and c#. is there something i can do. also.. what does the 24 in 'sudo nmap -sP 192.168.1.0/24' stands for?? First, is that your internal network, 192.168.1.0? If not, use an appropriate IP address range. Second, the 24 in the command represents CIDR notation. It means look for all 255 IP addresses in the fourth octet of the IP address. If none of this makes sense, you might want to read some of the basic networking tutorials here on Null Byte. (thanks for the really fast response. I want to hack into someone's computer that is outside the network, (By outside I mean he lives far away) The only thing I know is his Pubic IP Address, Can I or Can I not Hack into my Victim computer? If I can, then How? Any Guides Please? What you want to do sounds very illegal, especially for a white hat community. That's okay. As long as it's just a "scenario". is that your internal network, 192.168.1.0? If not, use an appropriate IP address range. the 24 in the command represents CIDR notation. It means look for all 255 IP addresses in the fourth octet of the IP address. Just stumbled onto this article. The comments are...interesting. I need someone to chat with about the in's and out's of how this really works...... my douché backwash of a bf is lying to me about everything I think.... it is a very messed up and twisted situation i have going on atm..... any advice is greatly appreciated. ... please pm me if you are brave.... thanks ..... have a magnificent day/night!! Sometimes I try and connect to the ports with netcat, but i never get a login prompt. and if i do, how do i exploit it? Another question, Let's say netcat returns me the version of the service, do i look it up on metasploit using the search command?